To further simplify your lab-work, Microsynth offers you two chemically optimized ready-to-use guide RNAs (crRNA and tracrRNA) which – together with the Cas endonuclease – can directly be used in your experiment without any cloning steps. Competitive pricing. Special offers for target libraries and screening crRNAs. Highest purity at no additional cost. The two component system allows you to use the same tracrRNA for all your experiments – so for every new target you will only buy the new crRNA. A team of chemistry and biochemistry experts who worked on developing this product are happy to support you (from 8 am to 5 pm)! CRISPR/Cas advanced to a standard technology in modern molecular biology and biotech labs in a very short time since its first publication in 2012. Every gene and/or target sequence can be made accessible for knock-down or homologous end join repair. In brief: two RNA strands – one of which is target specific - guide an endonuclease (Cas9) to the target side. Cas9 initiates a double strand break at your target side, leading finally to short deletions or insertions at the site (or homologous end joining repair in case you proved the system the appropriate gene segment). Short INDELS lead to a knock-down of the gene of interest. 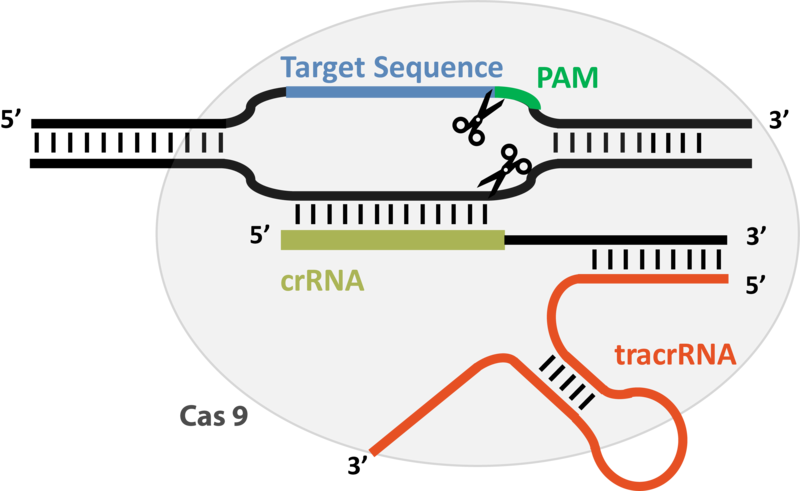 The CRISPR/Cas system can be programmed by simply designing the crRNA sequence in a way that it binds to your target side. The easy programmability makes CRISPR/Cas a preferred research tool. Microsynth’s ready to use two component CRISPR/Cas system consists of two RNA strands each modified with two types of modifications to increases nuclease stability and thus increase the efficiency of your experiments. You provide us your target sequence and we will synthesize your modified crRNA and tracrRNA. No cloning required: Simply anneal the two RNA strands, complex with Cas9 enzyme (in case your cells are not Cas9 competent) and transfect the complex using your lipofection agent of choice or electroporation. We will send your ready to use crRNAs and tracrRNA as soon as possible. Online ordering available very soon! Detailed information on our optimized crRNA and tracrRNA. CRISPR gene editing with optimized crRNA and tracrRNA from Microsynth.